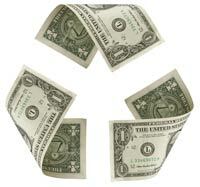 What is Debt Recycling? I asked myself the same question when I saw the phrase and discovered it is a rather interesting concept; especially to those that own a home. Debt Recycling kind of reminds me of a loopty loop process in a fashionable way. The idea is to reduce you non tax-deductible interest on a debt and replace it with a tax deductible interest on another debt. Suppose a few years back, you bought the house you live in for $200,000, and now its worth $350,000. First, you would then borrow up to 80% of the equity (or $120,000) as an investment loan. The advantage here is that the loan is fully tax deductible. Next, you take the $120,000 investment loan and put that to another investment vehicle – usually a managed plan or another property. Then, at the end of the year, the amount you repaid on your mortgage is reborrowed and added to your new investment vehicle. Make sense? So each year you rinse, repeat and lather – equity to investment vehicle. Now, the advantage to debt recycling is that the non tax deductible mortgage is slowly being converted into tax deductible investment. When your mortgage is paid off, you can then make the decision to sell your investment and pay off your investment loan, or keep the investment and make payments, or consider taking out a new investment loan against your home and increase or start another investment opportunity (reminds me of a Donald Trump strategy). Many people believe they need to pay off the mortgage before having enough money to build their wealth or make a substantial investment. But the problem with waiting until your mortgage is paid off – your investment will not have time to grow and mature. Debt Recycling allows you to borrow against the equity in your home and make a tax-advantaged investment that can pay off the mortgage and at the same time build you wealth. So, even though it sounds like a good way to increase your investment portfolio, there are some things to consider before taking part in this strategy. Make sure to hire a Certified Financial Planner to help you plan for this type of aggressive financial planning. Remember, if your investment falls in value, you end up losing. Do you have the financial cushion to survive the potential losses? This is a long-term investment strategy. Do not consider investing less than 5 years of your time with this type of strategy. If the interest rates on your loans increase dramatically, the profits decline. Tax laws could change, thus damaging your strategy and anticipated profits. If you are married, consider obtaining a nuptual agreement with your spouse – you’ve seen the current divorce proceeding with the McCourts – Major league Dodger’s owner, right? Need I say more. I guess, in that case, I should say have one solid nuptual agreement. Your assumptions are not fitting the outcome. Much like starting a business, its easy to become overzealous with the potential end results. Thoroughly research your investment opportunities before leaping in. Gain a second opinion from a colleague, a different opinion could help you see all sides of the opportunity. Make sure your CFP arranges adequate insurance for income protection, trauma, or death and disability. Currently, I do not think debt recycling is the right investment planning strategy. The housing market is great for those people that can afford to invest in home forclosures; preferably with cash. There are $500,000 properties being sold for $200,000 in my area right now. I say cash to invest instead of using the equity, because my husband and I were hit hard in this economic downfall. There was a $15,000 of equity in our home that soon skyrocketed to $250,000 equity during the housing boom (that was a nice feeling). But now we were hit hard and the home is valued (minimally) upside down – Ouch. Now if you take the equity from your home to invest it into a managed investment plan (now its sound like Warren Buffett) – buy low, sell high – could be a consideration. I would be interested on your take about debt recycling. Neat concept. But too much at risk? This entry was posted in Finances on 2010-09-24 by Christine. Please remember, you can deduct interest paid on the first 100k of home equity debt only. I should have mentioned in the last part, that using cash to invest in property at this time is a better option because so many of lost our equity in our original property.It is not feasible for a lot of people to consider debt recycling because of this. True. True. Thank you for your comment about the 100K. My husband and I are talking about this matter right now. LOL.The good thing, it can lead you to bringing in extra additional income once your investment property is paid.Or you hope your investment property increases enough that you make a sizeable profit. Or it might be a better investment to be in a manged fund. 🙂 Thank you for stopping by! This sounds quite risky in a recession or if the housing market is unstable. It would also have been very dangerous if one did this during the housing bubble, then when upside down on their mortgage. I would think the only time to do this kind of investing would be when housing prices are consistently rising. I notice that this process seems very popular in Australia because of their ‘love for property’. They must not be experiencing such economical issues like the US; especially in real estate. This is a good summary of a home leveraging strategy. During the go-go days of housing it even got so aggressive that some lenders were not only advocating “cheap” variable rate mortgages, but even interest-only mortgages in pushing such strategies. But I think we saw with the housing bust how quickly things can unravel; home values and investment values can plummet at the same time, and when that occurs this strategy is a total crash and burn (a risk you pointed out in your summary). In summary, leverage can be great…if it works. And it has worked for people – I’ve seen it. But in the end it came down less to the strategy as it did to very fortunate timing in the sale of their home, cashing out, and then investing at that point. But again, for those who were caught heavily leveraged after the housing market crashed, well…very painful. As a result, even though there is upside with such a strategy, it can be the cause of a lot of stressful days and sleepless nights. So is a debt recycling strategy worth it? I think that’s something people have to answer for themselves, but I personally do not think that it is. In my view a large part of effective personal financial management isn’t just about maximizing wealth, but also having peace of mind along the way, and a high-leverage strategy runs counter to that. Hi MRP, Debt Recycling reminds me of a Donald Trump process. Maybe its a better name for it. But I would assume that he writes some of these proceedings into business assets rather then personal assets, as the strategy suggests. If you have the gutso and can with stand a possible volatile strategy, then it may be right for someone. But for the masses, probably not. At least, not anytime soon. Sounds far too stressful for me in any economy! I just don’t think I am the kind of person that can keep a strong clear mind knowing debt is hanging around, no matter what kind of debt it is. LOL. I agree Forest. I would love to invest in Real Estate. But debt recycling seems too risky for me. I might just take a step back. I have to think that some debt is good debt. But I may chose to invest into the good-debt after I am bad-debt free. Seems a little too risky for me. But thanks for teaching me some new lingo! I’m pretty much allergic to debt and so I would have to forgo the additional earnings using leverage in my investments. I think this may work for those who have significant liquid assets in case of an emergency (or adequate insurance as you suggested). Very interesting concept of debt recycling. As with any other form of investment there are risks, but like you mentioned maybe right now is not the time to invest on real estate due to the economic fall. This type of investment would’ve been perfect about2-3 years ago…who would’ve known that this recession was coming?